Many birds, like warblers and hummingbirds, migrate annually no matter what. Others, including robins, kingfishers, and chickadees, are “partial migrants”: within a single population in a given year, some will migrate and some will not. Backyard birdwatchers who rejoice in the first robin of spring aren’t necessarily unobservant. There are fewer robins around in winter, and those that do stay often roost in bogs and swamps instead of backyards. 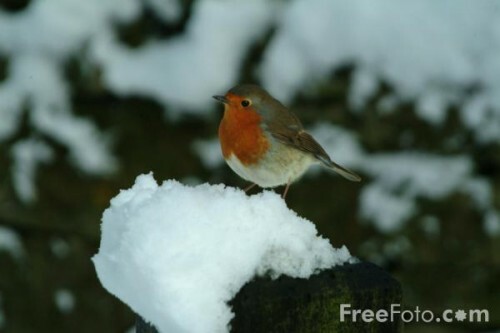 Each year, a robin must decide based on the available food supply whether to migrate; a snowy winter landscape can never provide as much food as the same land in summer. 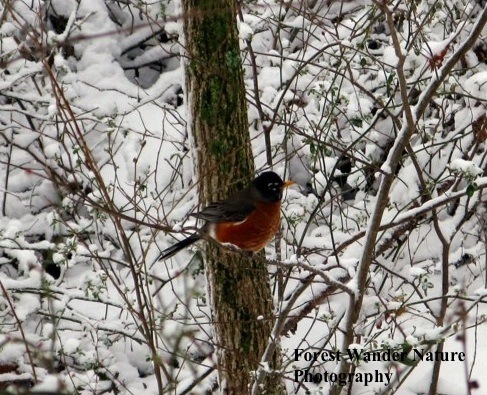 Some robins may even leave mid-season if the conditions turns especially harsh. They’re taking a gamble either way. Birds who reside year-round in temperate climates risk a 50-80% chance of death each winter. Migrants do a little better, with at most a 50% chance of death. But they invest a great deal of time and energy in migration that they could have put toward reproduction. Temperate residents make up for their high winter death toll with their better success raising offspring. Not all partial migrants have to make this annual choice. Within a single population of European robins (not closely related to American robins), genes dictate which individuals will migrate and which will stay. With these birds, migrants are born, not made. Gene-determined migrants like European robins are called obligate partial migrants, while American robins are examples of facultative partial migrants. Still other kinds of migrants do make a choice, but it’s a group decision. Evening grosbeaks and snowy owls, for instance, will leave their typical wintering grounds en masse if the autumn produced a poor seed crop. Then they pop up in unexpected places in what’s called an irruption: an unpredictable winter boom of birds. The robin outside my window, though, didn’t have the advantage of consensus to decide where to spend this winter. She reminds me that animals are individuals who must make daily life decisions based on their experiences. Watching her hunched under the cover of a dripping rhododendron, I hope she made the right one. Information gathered from The Handbook to Bird Biology published by the Cornell Lab of Ornithology; Living on the Wind: Across the Hemisphere with Migratory Birds by Scott Weidensaul; and the Audubon Society and Smithsonian field guides to North American birds. This entry was posted in Migrations, Seasons, Wildlife. Bookmark the permalink.